Background: Neurotoxicity side effects related to cyclosporine kinetics could lead to dysfunction of kidney graft and patient outcome after transplantation. The aim of this study was evidence-based pharmacotherapy of kidney transplant recipients and to investigate neurotoxic levels of Iminoral. Materials and Methods: The results of 2239 cyclosporine trough levels obtained from 743 patients were studied. Seventy-five adult kidney recipients who received Iminoral were studied for neurotoxicity symptoms. Demographic, clinical, hematology and biochemical data were recorded in d-base and analyzed using SPSS application for windows. Results: The mean value related to cyclosporine C 0 was 246.3 μg/l. In the 48% the signs of neurotoxicity such as tremor and headache were noted, but only in 9% the levels of cyclosporine C 0 were >400 μg/l. Further studies on 75 patients showed that the incidence of neurotoxic side effects were as follows: Tremor in 35, headache in 24 and anxiety in 34 recipients of kidney. The prescribed drug regimens from the day of transplant in most patients were based on mycophenolic acid or cellcept, pulse therapy using methylprednisolone (daily from kidney transplant up to 3 days after transplant), cyclosporine or Iminoral plus other drugs related to each individual. Administrations of ganciclovir, thymoglobulin, clotrimazol and prednisolone were also distinguished with immunosuppressant-based therapy simultaneously. Conclusion: Evidence-based study related to pharmacotherapy of Iminoral showed that clinical presentation related to neurotoxic side effects such as tremor, headache and anxiety might be due to many factors such as polypharmacy. Planning immunosuppression to individual patients based on programmed therapeutic Iminoral monitoring, avoiding polypharmacy in terms of removal or drug minimization and focusing on first week after transplant seem to be a realistic option. Transplantation is a well-established management for patients with mainly end-stage kidney diseases. Therefore, they require cautious management to prevent rejections (hyperacute-acute/chronic) or toxicity related to immunosuppression therapy. The inhibitor of calcineurin, cyclosporine is one of the main immunosuppressive drugs used after organ transplantation but the frequency of neurotoxicity from calcineurin inhibitors seems to be dissimilar. The slow and variable absorption of cyclosporine appears to be prejudiced by a series of issues such as, time after transplantation, presence of food and intestinal dysfunction. Inconsistencies in cyclosporine trough concentrations (C 0 ) are the result of marked disparities in the kinetic factors, such as clearance (CL) and bioavailability (F). ,,,,,, Previous publications reported that cyclosporine distribution could be affected by the lipoprotein concentration in plasma and hematocrit. , Cyclosporine is widely metabolized and hepatic metabolism is a main pathway of cyclosporine elimination. Inducers or inhibitors of cytochrome P450 (CYP450) could influence the metabolism of drug. , Adverse effects of cyclosporine are dose-related and therapeutic cyclosporine monitoring involves the use of C 0 measurements to individualize dosage regimens derived from kinetic values. Long period of cyclosporine exposure might induce renal dysfunction that results to nephrotoxicity. , Complexity related to central nervous system is numerous in recipients of kidneys and may mostly donate to morbidity and mortality. The post transplant neurological complications may be categorized as immunosuppressive medications, stroke, peripheral neuropathies, infection, and malignancies. Previous reports confirmed that immunosuppressive agents could cause neurotoxicity difficulties. Akinetic mutism, nephrotoxicity, hypertension, diabetes mellitus are some reported neurotoxic effects. A recent publication confirms that cyclosporine might induce neurotoxicity in spite of the low level in brain. The frequency of neurotoxic side effects related to cyclosporine is thought to be 10-25%. In solid-organ transplantation, neurotoxicity seems to occur more often with liver transplantation than with heart or renal transplantation. In most cases, neurologic signs and symptoms, such as seizures, confusion, or coma, occur within the first few days after transplantation. Mitochondria play a key role in cell death processes, notably through the opening of the permeability transition pore. ,,, A recent publication confirmed that intensive immunosuppressive regimen might be accompanied with a higher risk for CMV infection. Guillain-Barré syndrome may also expand, triggered in some cases by cytomegalovirus (CMV) or Campylobacter jejuni infection. Lymphomas are the most frequent brain tumors. They are typically connected to Epstein-Barr virus (EBV) infection and are more frequent in patients with vicious immunosuppressive prescriptions. Infection differentiates the most common neurological impediments. Acute meningitis typically founded by Listeria monocytogenes, subacute and chronic meningitis caused by Cryptococcus neoformans, focal brain infection by Aspergillus fumigatus, Toxoplasma gondii or Nocardia asteroides, and developing dementia explored by polyoma J virus or other viruses are the majority recurrent categories of neurological contaminations. ,,, Iminoral which is a generic formulation of cyclosporine has been manufactured by Zahravi Pharmaceutical Company (Tabriz, Iran). As drug-drug interactions could influence the pharmacokinetics of immunosuppressant, therefore, to achieve an appropriate clinical management related to logical clinical pharmacotherapy, the aim of this study was evidence-based-Iminoral therapy after kidney transplantation in Isfahan/Iran. A total of 2239 results associated to cyclosporine trough concentrations (C 0 ) obtained from 743 kidney recipients with a mean age of 38 years comprised of 499 males and 244 females were studied. Seventy-five patients comprising of 28 females and 47 males, with a mean age of 40.6 years (ranged: 20-64 years old), were considered further to be studied for the presence or non-presence of tremor, anxiety, headache and sleep disorders. As the design of study was population-based, therefore, due to pharmacokinetic differences among adults and children, the only exclusion criteria were children. The study was conducted to Isfahan Neurosciences Research Centre (INRCC) and approved by research ethics committee (grant number 290295). All patients received cyclosporine orally twice a day. Because of wide inter- and intra- individual variability, recipients were required to meet the following inclusion criteria: Alive and age between 18 and 65 years. Other drugs such as ganciclovir, Anti-thymocyte globulin (ATG), mycophenolic acid or cellcept, tacrolimus, trimethoprim/sulfamethoxazole or co-trimoxazole, cyclosporine or Iminoral were noted from the medical records. Additional information including present and past clinical history, re-transplantation, hospital stay, presence of headache, tremor, anxiety, sleep disorder and other complications were recorded in Excel. Statistical analyses were performed using SPSS application for widows. Descriptive statistics such as means, median and range was calculated for variables of interest. The mean value related to cyclosporine trough concentrations (C 0 ) was 246.3 μg/l (ranged; 16.5-1261 μg/l). As shown in [Figure 1] in 51.3% cyclosporine whole blood levels with a value of <200 μg/l predict not to be essential to prevent graft rejection and in these recipients calcineurin phosphatase activity might be inhibited by <50% which leads to rejection. 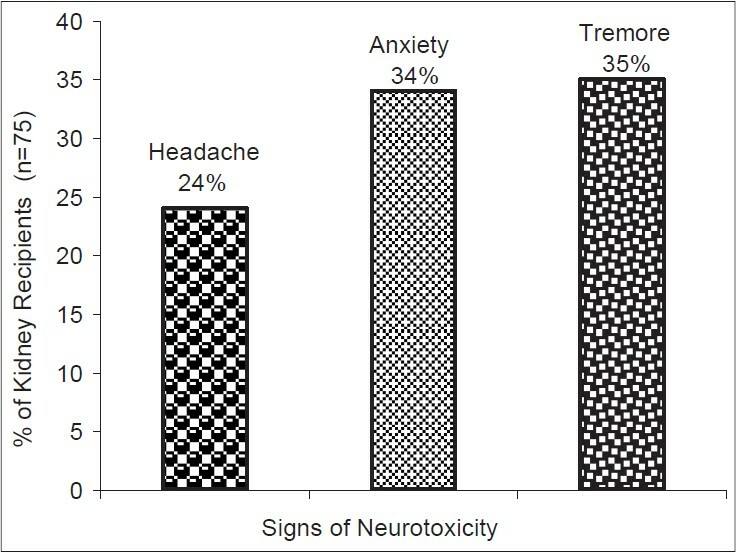 The sings of toxicity including nephro- and neurotoxicity distinguished as 48%. In the 9% of patients' cyclosporine blood levels were >400 μg/l on the day toxicities encountered. Seventy-five patients were studied further. 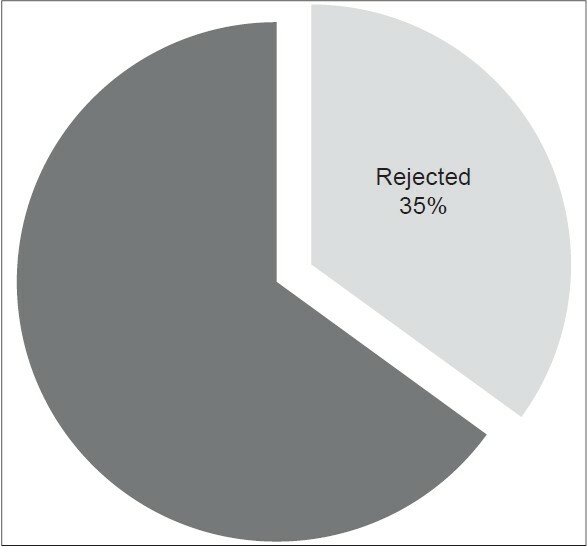 As shown in [Figure 2], 35% have showed evidence of rejection according to medical note. Tremor, headache and anxiety were identified in 47%, 68% and 45% with suggestion of likely non-stable circumstance [Figure 3]. [Table 1] shows evidence-based immunosuppressive therapy in kidney transplanted recipients. Prescriptions were based on administration of Iminoral at one dose before transplant and continues immunosuppressant in combination with other drugs. Kidney recipients in most cases received a combination of two immunosuppressant based on cyclosporine and mycophenolic acid plus pulse of methylprednisolone one dose before transplant and maintains dose for three days after transplant. A scenario related to prescribe drugs could be discussed against individual cases. The drug regimens in a twenty-two years old lady with code no 2 on day of transplant were as follows: Amp ganciclovir -amp hydrocortisone- amp tymoglubuline- amp tazocin- tab minoxidil (6 days after operation)-tab clonidin (3 days after operation)- cap cograft (7 days after operation)- tab pentoprazol (1 day after operation)- tab acetaminophen (1 day before operation)- cap cellcept (1 day before operation)- supp clotrimazol (five days after operation)- tab captopril- tab dilitiazem (day of operation)- tab prednisolone. Prescriptions at the time of discharge from the hospital in a 60-year-old lady with code no. 23 were based on coadministration of sandimmune, rocatrol, leveotiroxin, cellcept, amitriptyline, gabapentin and amlodipine. The level of cyclosporine noted as 289 μg/l. On the day of transplant for this patient the drug regimen were as follows: Cap Iminoral- tab cellcept- spray serotide- methylprednisolone- amp cefazolin- cap omeprazol - tab levothyroxine- spray atrovent-spray salmeterol-tab co-trimoxazole- aciclovir (1 day before transplant). In a 51-year-old male with code no. 20, the prescribed drug regime for discharge from the hospital was as follows: Tab prednisolone- tab cotrimoxazole- tab plavix- tab digestive- tab cellcept- tab folic acid- tab fursomide- tab atrovastatine- tab pentoprasol- tabcarvedilol. 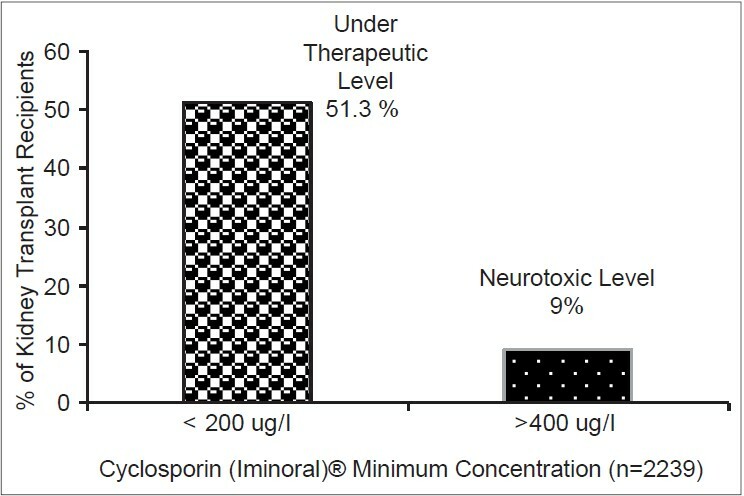 Cyclosporine trough concentrations (C 0 ) stated as 146 μg/l. In another 55-year-old male patient with code no. 22, cyclosporine trough concentrations (C 0 ) stated 122 μg/l. This patient discharged from hospital with a combination of drugs based on Iminoral, cellcept and prednisolone. Judgment associated with immunosuppressive neurotoxicity may be realized by the grouping of new-onset neurological shortfalls, current beginning of a new treatment drug and characteristic results on magnetic resonance imaging. ,,,, Neurological adverse effects associated with post-transplant immunosuppression most commonly develop during the high levels of cyclosporine and can be categorized as a major (expressive aphasia, seizures, confusion, psychosis, encephalopathy, persistent coma) or a minor (tremors, headache, sleep disturbances, nightmares, dysesthesias, photophobia) neurotoxicity. Co-administration of cyclosporine, cellcept and pulsetherapy using methylprednisolone seems to be routine regimen for nearly all kidney recipients immediately after transplant. Previous publication reported that combination of cyclosporine with high doses of methylprednisolone, in a 33-year-old male with cystic fibrosis, caused severe neurotoxic signs tended to coma. Out of 75 kidney transplant recipients, tremor, headache and anxiety were identified in 47%, 68% and 45%. This is in agreement with previous publication in which it was reported that calcineurin inhibitors may cause mild symptoms, such as tremors and paresthesia, or severe symptoms, such as disabling pain syndrome and leukoencephalopathy. ,,,, ABCB1 polymorphisms may be supportive in estimating convinced cyclosporine-linked adverse effects in renal transplant recipients. Cyclosporine is metabolized by intestinal and hepatic CYP3A4/3A5 and transported across the cell membrane by P-glycoprotein. Drug interactions with mycophenolic acid occur mainly through inhibition of their enterohepatic recirculation, either by interference with the intestinal flora (antibacterials) or by limiting drug absorption (resins and binders). Cyclosporine inhibits the enterohepatic recirculation of mycophenolic acid, resulting in significantly lower concentrations and therefore risk of underexposure. Studies performed by de Jonge in 2011 confirmed that in vivo hepatic and first-pass CYP3A activities are considerably poorer in patients getting cyclosporine than tacrolimus. ,,,,,,, Finally, reduction in the number of medication could help to decrease adverse effects related to polypharmacy. To avoid drug-related side effects such as nephro- and neurotoxicity, acute or chronic rejections, more clinical studies related to Iminoral seem to be useful. Thanks to Isfahan University of Medical Sciences for grant No. 290295. Thierry A, Mourad G, Büchler M, Choukroun G, Toupance O, Kamar N, et al. Three-year outcomes in kidney transplant patients randomized to steroid-free immunosuppression or steroid withdrawal, with enteric-coated mycophenolate sodium and cyclosporine: The infinity study. J Transplant 2014;2014:171898. Arnold R, Pussell BA, Pianta TJ, Lin CS, Kiernan MC, Krishnan AV. Association between calcineurin inhibitor treatment and peripheral nerve dysfunction in renal transplant recipients. Am J Transplant 2013;13:2426-32. Kahan BD. The evolution of therapeutic immunosuppression and the potential impact of drug concentration monitoring. Ther Drug Monit 1995;17:560-3. Tolou-Ghamari Z, Palizban AA. Laboratory monitoring of cyclosporin pre-dose concentration (C 0 ) after kidney transplantation in Isfahan. Iran J Med Sci 2003;28:81-5. Tolou-Ghamari Z, Palizban AA, Gharavi M. Cyclosporin trough concentration rejection relationship after kidney transplantation. Indian J Pharmacol 2003;35:395-6. Tolou-Ghamari Z, Palizban AA. The history of liver and renal transplantation. Internet J Pharmaco 2003;2:24. Gabe SM, Bjarnason I, Tolou-Ghamari Z, Tredger JM, Johnson PG, Barclay GR, et al. The effect of tacrolimus (FK506) on intestinal barrier function and cellular energy production in humans. Gastroenterology 1998;115:67-74. Tolou-Ghamari Z, Wendon J, Tredger JM. In vitro pentamer formation as a biomarker of tacrolimus-related immunosuppressive activity after liver transplantation. Clin Chem Lab Med 2000;38:1209-11. Fahr A. Cyclosporine clinical pharmacokinetics. Clin Pharmacokinet 1993;24:472-95. Akhlaghi F, Trull AK. Distribution of cyclosporine in organ transplant recipients. Clin Pharmacokinet 2002;41:615-37. Toledo Perdomo K, Navarro Cabello MD, Pérez Sáez MJ, Ramos Pérez MJ, Agüera Morales ML, Aljama García P. Reversible acute encephalopathy with mutism, induced by calcineurin inhibitors after renal transplantation. J Nephrol 2012;25:839-42. Tolou-Ghamari Z. Antiepileptic drugs (AEDs) polypharmacy could lead to buried pharmacokinetic interactions due to CYP450. Drug Metab Lett 2012;6:207-12. Sereno J, Rodrigues-Santos P, Vala H, Rocha-Pereira P, Alves R, Fernandes J, et al. Transition from cyclosporine-induced renal dysfunction to nephrotoxicity in an in vivo rat model. Int J Mol Sci 2014;15:8979-97. Nafar M, Roshan A, Pour-Reza-Gholi F, Samadian F, Ahmadpoor P, Samavat S, et al. Prevalence and risk factors of recurrent cytomegalovirus infection in kidney transplant recipients. Iran J Kidney Dis 2014;8:231-5. Bayers SL, Arkin L, Bohaty B, Paller AS. Neurotoxicity in the setting of pediatric atopic dermatitis treated with modified cyclosporine and itraconazole. J Am Acad Dermatol 2013;69:e177-8. Lamarche F, Carcenac C, Gonthier B, Cottet-Rousselle C, Chauvin C, Barret L, et al. Mitochondrial permeability transition pore inhibitors prevent ethanol-induced neuronal death in mice. Chem Res Toxicol 2013;26:78-88. Berntsen HF, Wigestrand MB, Bogen IL, Fonnum F, Walaas SI, Moldes-Anaya A. Mechanisms of penitrem-induced cerebellar granule neuron death in vitro: Possible involvement of GABAA receptors and oxidative processes. Neurotoxicology 2013;35:129-36. Lischke R, Simonek J, Stolz AJ, Schützner J, Belsan T, Marusic P, et al. Cyclosporine-related neurotoxicity in a patient after bilateral lung transplantation for cystic fibrosis. Transplant Proc 2004;36:2837-9. Ponticelli C, Campise MR. Neurological complications in kidney transplant recipients. J Nephrol 2005;18:521-8. Thamer M, Chan JK, Ray NF, Vassalotti JA, Kimmel PL. Drug use concomitant with cyclosporine immunosuppressive therapy for 3 years after renal transplantation. Am J Kidney Dis 1998;31:283-92. Iyer RS, Chaturvedi A, Pruthi S, Khanna PC, Ishak GE. Medication neurotoxicity in children. Pediatr Radiol 2011;41:1455-64. Wang YY, Zhang M, Lu FM, Jiao Z, Qiu XY. CYP3A4 genetic polymorphisms predict cyclosporine-related clinical events in Chinese renal transplant recipients. Chin Med J (Engl) 2012;125:4233-8. García M, Macías RM, Cubero JJ, Benítez J, Caravaca F, Gervasini G. ABCB1 polymorphisms are associated with cyclosporine-induced nephrotoxicity and gingival hyperplasia in renal transplant recipients. 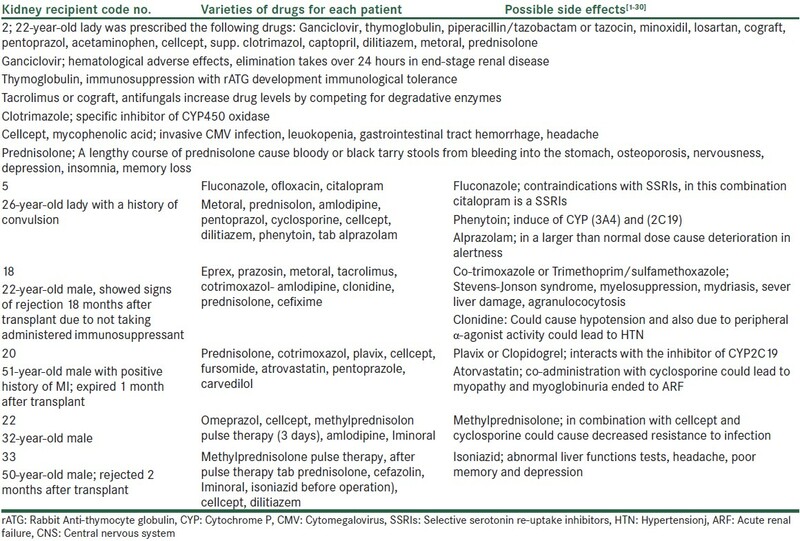 Eur J Clin Pharmacol 2013;69:385-93. Tolou-Ghamari Z, Najafi MR, Habibabadi JM, Zare M. Preliminarily analysis of carbamazepine (CBZ) C0 in patients visited Isfahan Epileptic Clinics. Int J Prev Med 2013;4(Suppl 2):S343-6. Tolou-Ghamari Z, Zare M, Habibabadi JM, Najafi MR. Antiepileptic drugs: A consideration of clinical and biochemical outcome in patients with epilepsy. Int J Prev Med 2013;4(Suppl 2):S330-7. Tolou-Ghamari Z, Zare M, Mehvari-Habibabadi J, Najafi MR. A quick outlook to the world of carbamazepine pharmacokinetics in epilepsy from 1953 to 2012. J Res Med Sci. 2013 Mar;18(Suppl 1):S81-5. Kuypers DR. Immunotherapy in elderly transplant recipients: A guide to clinically significant drug interactions. Drugs Aging 2009;26:715-37.
de Jonge H, de Loor H, Verbeke K, Vanrenterghem Y, Kuypers DR. In vivo CYP3A activity is significantly lower in cyclosporine-treated as compared with tacrolimus-treated renal allograft recipients. Clin Pharmacol Ther 2011;90:414-22. Hadjistavropoulos T, Kaasalainen S, Williams J, Zacharias R. Improving pain assessment practices and outcomes in long-term care facilities: A mixed methods investigation. Pain Manag Nurs 2013. [Epub ahead of print].